Today is the 950th anniversary of the Battle of Hastings – the single battle that has perhaps done more to shape the destiny of England than any other. The fate of England, and indeed, Europe, looked very different in the evening of 14 October 1066 than it had early that morning. This seems a good time to talk about two forthcoming novels that I am very proud to have co-written with the superbly talented J.A. Ironside, which will be published later this year or early next. The Oath and Crown Duology – Book 1, entitled ‘An Argument of Blood’, and Book 2, ‘A Black Matter for the King’ will be published by Penmore Press – see their website for more information and updates. 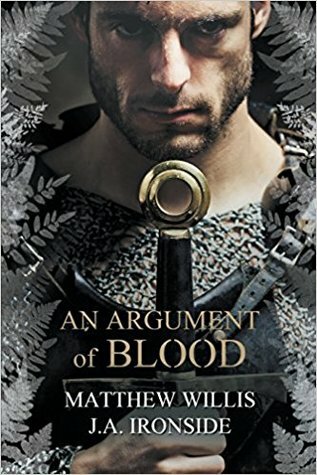 William, the impetuous and headstrong young duke of Normandy, faces treachery, assassination attempts, and open war as he tries to cling to power over his own ducal fief. Meanwhile in England, Ælfgifa, the malformed and unwanted youngest sister of Harold Godwinson, finds herself caught up in intrigues and political manoeuvring in the court of Edward the Confessor as powerful men vie for influence. Their paths will collide as England and Normandy’s fates collide, and both must fight to shape the future. ‘Quickly they spurred the horses again, and leapt back up the hill. The Norman infantry opened up once again, and for the second time, William hurled his spear into the Saxons’ wall with all the force he could muster, screwing up all the fury and betrayal he could direct at Harold into the throw. He turned the horse away again, just as a huge Saxon stepped out of the line right ahead of him. William hauled at the reins and put his full weight onto the right stirrup, hearing nothing but the thudding of blood in his ears. The Saxon was swinging something above his head – a great, two-bladed battle axe. Swinging down, meeting his onrushing horse, and struck at the charger’s shoulder.